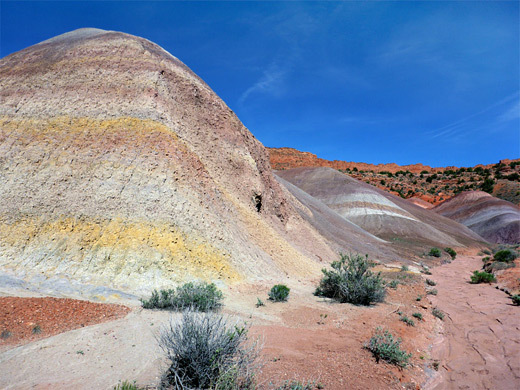 Multicolored, eroded rock formations dominate most of southeast Utah, though particularly outstanding is the desert either side of the Paria River, beneath the Vermilion Cliffs - seen for example along the Cottonwood Canyon Road or at the Paria Rimrocks. 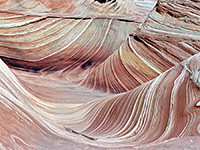 The kaleidoscopic scenery extends a little way south into Arizona, before the land becomes more sandy and barren, and all can be visited free of charge and with no access restrictions apart from the Paria Canyon system and one small area spanning the UT/AZ border (mostly in Arizona); this is Coyote Buttes, which was unknown before the mid 1990s but is now quite popular mostly because of just one formation, The Wave, a small ravine between eroded sandstone domes formed of amazingly beautiful rocks containing thin, swirling strata. The location was first publicized in Germany, in magazine articles and a movie ('Faszination Natur' by Gogol Lobmayr, 1995), and for the following few years was visited only by a small number of Europeans, becoming widely known just in the last decade or so. 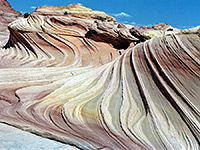 All the formations are contained within the Paria Canyon-Vermilion Cliffs Wilderness, of which the majority (the Arizona section) is also part of Vermilion Cliffs National Monument. Because the BLM considers the formations to be particularly delicate, Coyote Buttes is subject to fees, entry limitations and other regulations, with visitors having to apply in advance for a small number of daily permits. Coyote Buttes are the far southern portion of the Coxcomb Ridge, a 40 mile escarpment that parallels much of the Cottonwood Canyon Road and provides an impressive barrier to US 89 between Kanab and Page. The buttes are reached by House Rock Valley Road which links US 89 with ALT-US 89, south of the Vermilion Cliffs in Arizona. 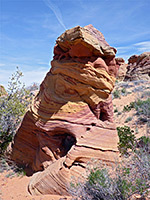 The southern part of this track may have soft sand or mud at some times of the year and a rather longer drive (21 miles vs. 8.5 miles) is required to reach the main Coyote Buttes trailhead, so the northern route is preferred; this still rather bumpy road is also used to reach the Buckskin Gulch slot canyon, and the trailhead for the Wave is the same as for the Wire Pass entrance of the gulch. The BLM divides the Coyote Buttes into two equally sized sections, North and South (see map). 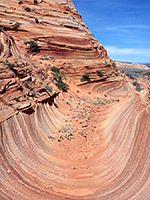 The northern region contains the Wave and most of the other famous sites, and extends from Wire Pass about 4 miles south (2 miles in Utah and 2 miles in Arizona), while the southern section stretches a further 4 miles. Apart from the Wire Pass trailhead, the only other easily reached starting point for Coyote Buttes North is The Notch, 2 miles from Wire Pass, where a trail crosses a pass in the cliffs and leads to the south end of the north section. South Coyote Buttes is generally harder to reach though a lesser quality dirt track provides access from the east, while the very southern end (Paw Hole) can be reached by a 2.6 mile 4WD track starting from Lone Tree Reservoir, along House Rock Valley Road. An alternative way to reach this area is by an off-trail, cross-country hike starting directly from House Rock Valley Road, climbing right over the main ridge; between 2.5 and 3.5 miles, depending on the route. Along here are several sites of interest including Top Rock Spring, a hidden arch, a group of stripy mounds and the tepees of Cottonwood Cove. Entry to North or South Coyote Buttes costs $7 or $5 per person respectively, with a limit of 20 people for each region and no more than six in a single group (see www.blm.gov/az/paria/index.cfm). For either region, the permits may be applied for up to four months in advance. Half the daily tickets for the very popular north section are issued via an online lottery, for which an extra $5 administration fee is added to each application. These permits are always greatly oversubscribed, sometimes by a factor of a hundred or more. Administration fees for failed applications are non-refundable. The other ten permits are issued on the day before travel to walk-in visitors at the Grand Staircase-Escalante National Monument Visitor Center in Kanab, Utah, again chosen via lottery. For South Coyote Buttes the permits can be reserved in advance using a calendar system, and all tend to be taken about two months prior to the date of travel. All successful applicants receive a copy of the access regulations and, for North Coyote Buttes, a topographic map to help identify the route to the Wave, which is not so well marked on the ground. A permit is also required for dogs - another $5. 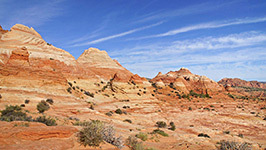 No overnight camping is permitted anywhere in the area; the nearest locations for this are along House Rock Valley Road.